Prague - Jan Amos Komensky, "The Teacher of Nations"
"I led a wandering life. I had no homeland. I was constantly propelled from one place to another, never and nowhere did I find a permanent home." Here is Jan Amos Komensky. Johann Amos Comenius; on a Czech korun. 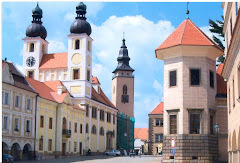 He lived in Prague and other places including Heidelburg, Germany; educator, philosopher, writer, priest (Protestant), in exile after the re-Catholicization of Vienna reached the Czech nation. Yet, he devised a school that advocated teaching through play; preschool work with the smallest pupils; that nations speak together (later a foundation in concept for The United Nations), and here he is - see http://www.radio.cz/en/article/25962. The greater tribute to Komensky as a teacher - one who cares and not only reaches out, but is in position ready to grasp and help, is this depiction on on the reverse of the korun - see discussion at Bogomilia, Jan Amos Komensky.